We probably got about 5 hours of sleep before we were up and ready to start the journey to Machu Picchu at 3:30 am. The first leg of the early morning was in a very speedy van that went around so may curves at a ridiculous speed on our way to Ollantaytambo where we would catch the train to Aguas Calientes. It was freezing in the morning and the van was not heated along from being completely impractical for sleeping, despite how tired we were. When we finally got on the train it was a very nice surprise to have comfortable window seats and heating! They even came around with a drinks cart and we had cafe con leche! 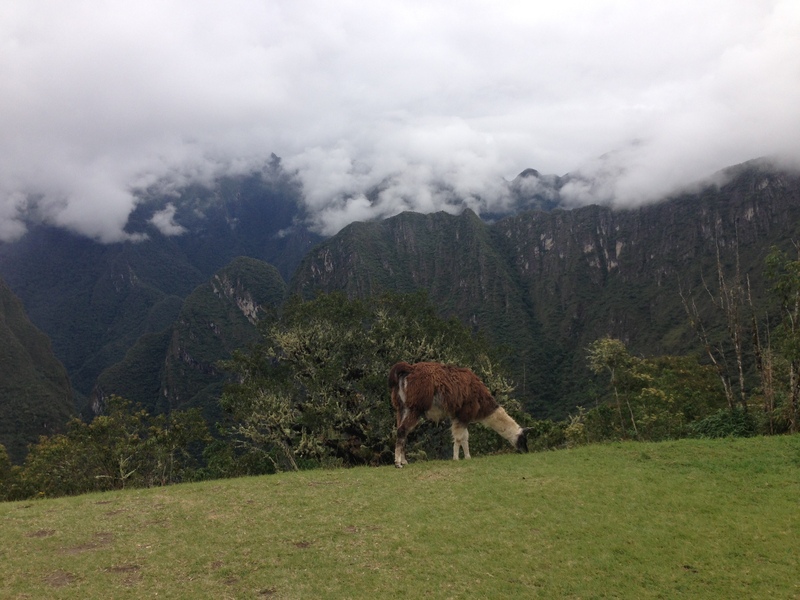 By the time we got to Aguas Calientes the weather had improved a little. It was a cloudy day, but not too hot and not too cold, perfect weather for spending the day atop a mountain in my opinion. We made sure to use the restroom promptly before our group tour left since there are obviously none in the ruins… Our travel adviser put us in an English tour group. At first we were both a little disappointed since Jess and I both speak Spanish (hers is MUCH better than mine), but after the initial introductions with the rest of our group we were both at ease. Our tour guide was very nice and spoke English very well, he was pretty intense though. 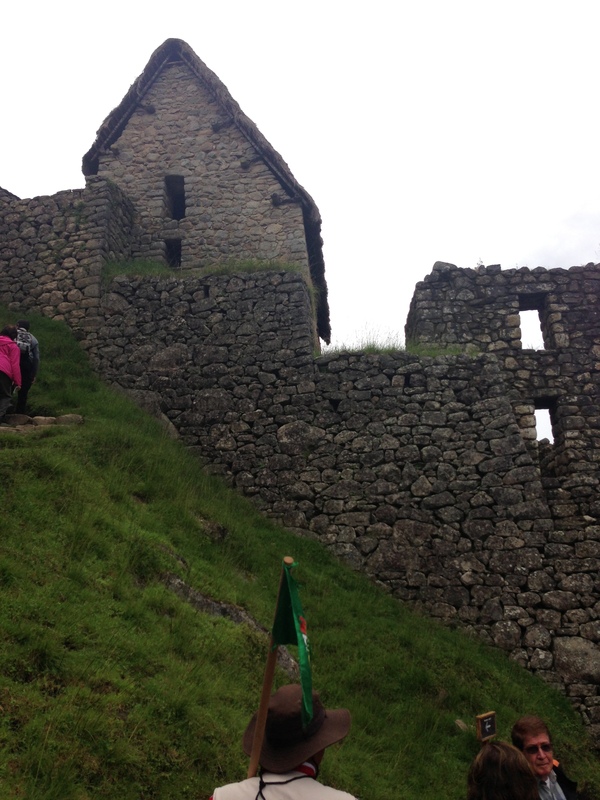 We learned a lot about the Incas and the uses of the village and mainly that the town isn’t called Machu Picchu! 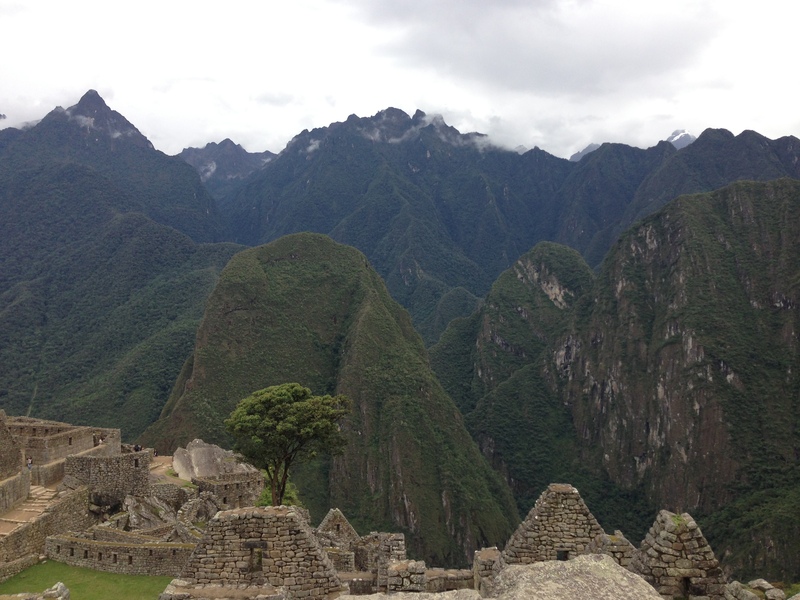 The mountain the ruins were built on is actually named Machu Picchu. At the end of the tour we were left with plenty of free time to explore the village and look around the mountain. 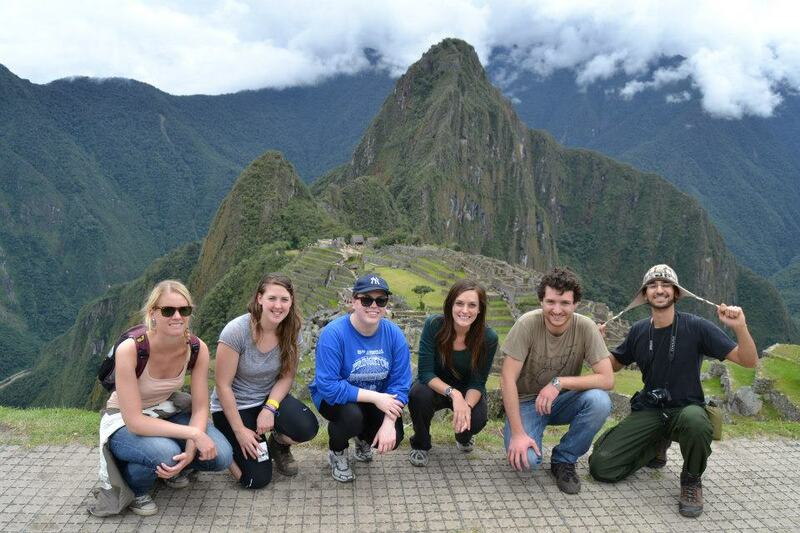 A few other people from our group had decided to climb to the top of Machu Picchu to the sun gate. Above is the view from the top of the mountain allllll the way to the bottom. The sun gate is about a mile away from the village and uphill… So naturally it took us about an hour including some breaks. In the picture above you can see the windy road the buses take. It was beautiful to be at the top of the mountain, at a few different points some clouds came up around us, it was an amazing experience. Of course we were exhausted. This was our group of international friends. Countries of origin left to right: Germany, UK, US and US, Argentina, Brazil. 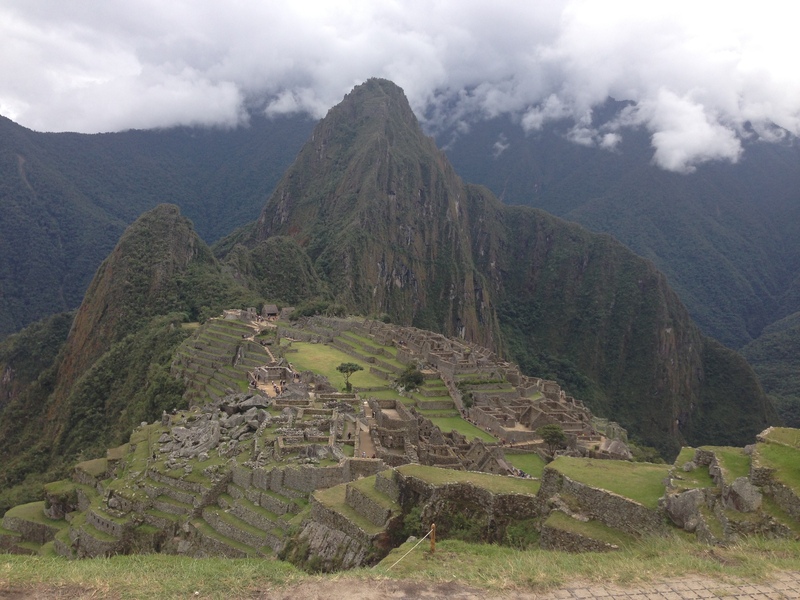 At this point I have to mention something important that I have left out so far- when we got to Machu Picchu I attempted to turn on my camera…. and it wouldn’t turn on. I had plugged it in to charge it the night before and didn’t think anything of it. But the battery was shocked so I carried it all day long and took all the pictures on my iPhone. 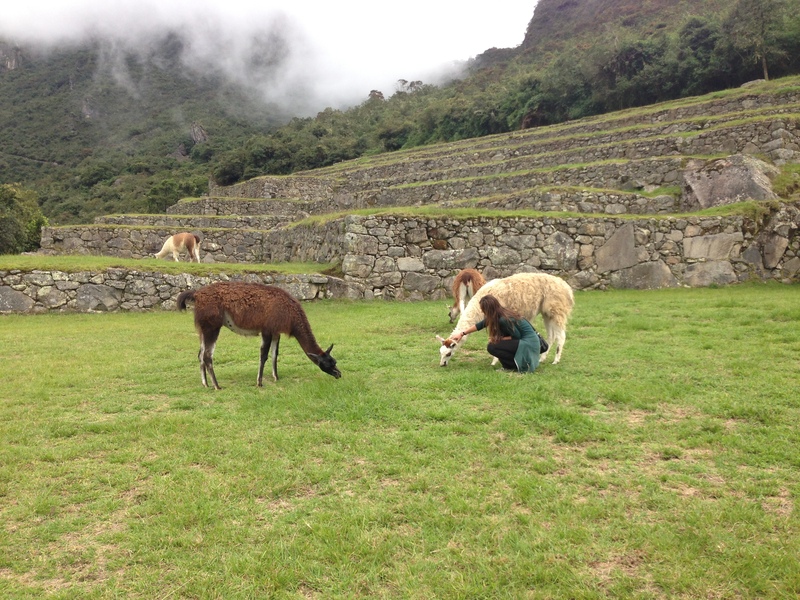 After our trip to the Sun Gate we descended back to the terraces and saw llamas! 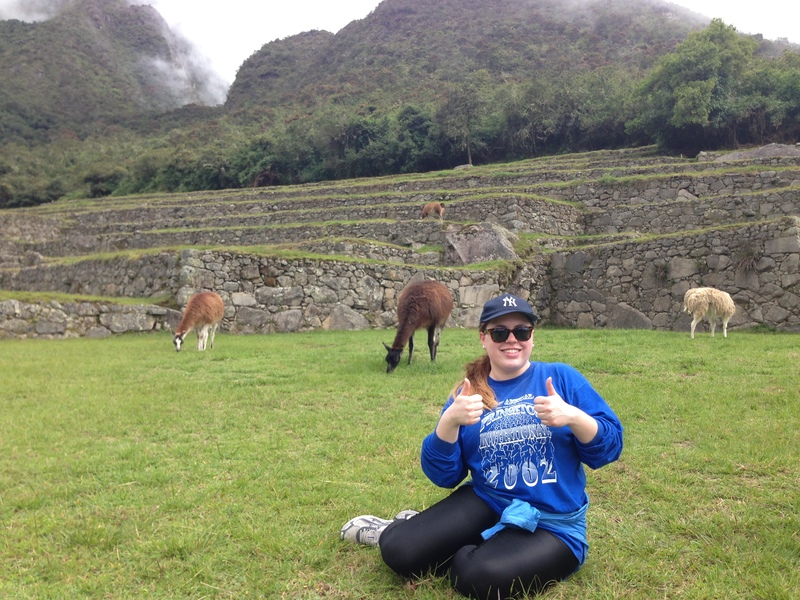 After our time with the llamas we went to the other side of the mountain to relax and snack. 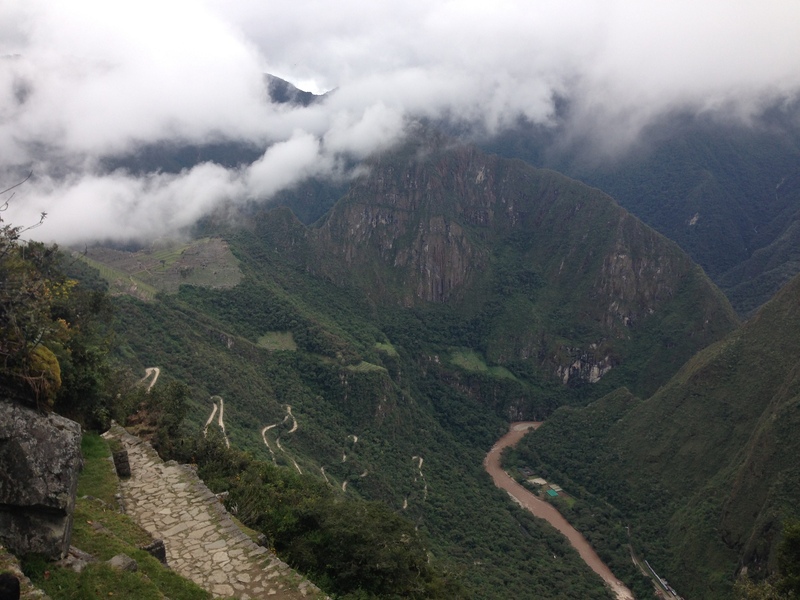 When we were done eating we ended up taking another little detour to the Inca Bridge which is basically a few logs scanning a gap in the side of the mountain…. A lot of epic picture taking occurred, but I didn’t get to take many pictures on my phone. We were all tired so we decided to head down the mountain to Aguas Calientes to get some dinner. Jess and I met up with two of our other friends from the group and had a classic Peruvian drink called Pisco Sours. They were good, but not my favorite- eggs are one of the ingredients. But it wasn’t that bad. At the end of the day we got back on the train, back on the bus, and eventually we were back in the hotel ready to sleep. 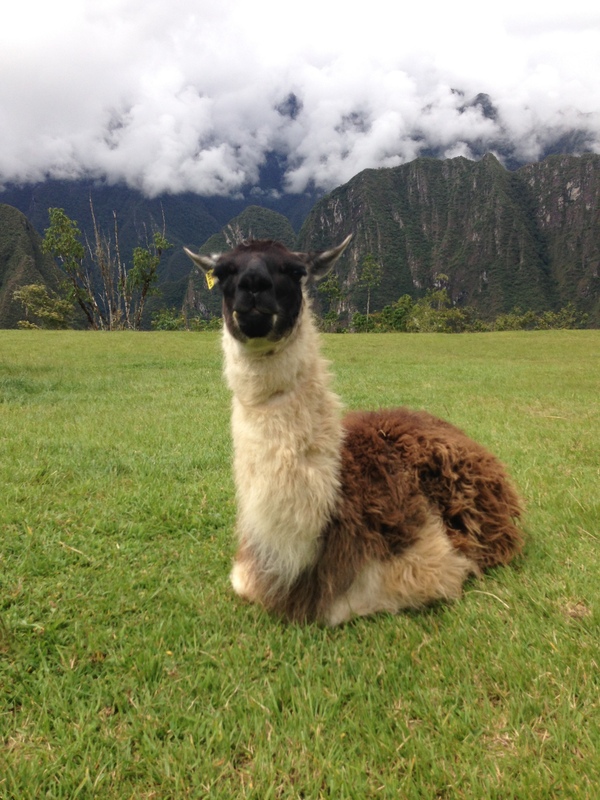 The following day we left Cusco. We spent the morning doing tourist and souvenir shopping after breakfast and then got Starbucks and relaxed at the Plaza since there was a military parade going on 😉 That afternoon we flew back to Lima and I got to meet her host family and spend some time with them. It was a really nice experience and Lima was beautiful. The trip home was 3 more plane rides and I eventually made it back to the US, but it was so worth all the travel and expenses and exhaustion! 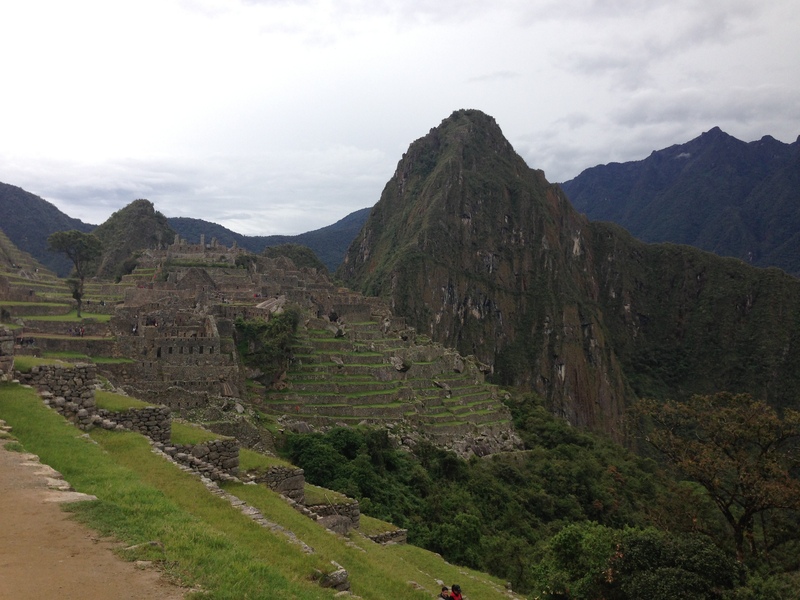 This entry was tagged cusco, flying, lima, Machu Picchu, peru, travel. Bookmark the permalink.